It looks like it is in relatively open water now. Although now "clearly" in Baffin Bay, the ice island has been in Baffin Bay since it entered Hall Basin, according to http://en.wikipedia.org/wiki/File:Baffin_Bay,_Canada.svg. The International Hydrographic Organization (per Wikipedia) defines the northern limits of Baffin Bay as a line from Cape Sheridan (E of Alert, Ellesmere Is.) to Cape Bryant, Greenland (approx. due E of Alert), and includes all of Nares Strait, etc. (The first Wikipedia map of Baffin Bay shows grossly inaccurate northern and southern boundaries - actual official boundaries being significantly north of the indicated boundaries). Looks like she's broken in two now! I'm guessing it snagged on an unmapped sea mound and at the speed she was going broke into the 3 fragments I'm counting. Does this leave us with PII-2012-A-1, PII-2012-B-1. PII-2012-C-1 or PII-2012-A-1, PII-2012-A-2 and PII-2012-A-3? I think it's the latter set since IIRC a PII-2012-B had split off last year in Nares Strait. Instead of having to dodge one bullet it seems as though the Hibernia Platform may have to evade a fusilade. As reported earlier by Phil. 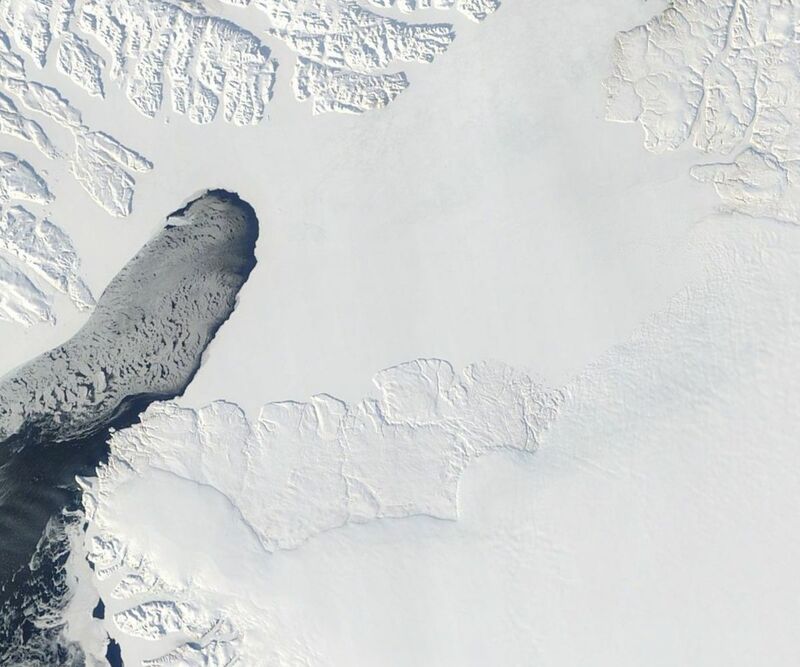 The 200 meter thick ice island did plow into the bottom and broke apart cleanly along a central channel where the ice is only half as thick as it is towards the sides of these channels. More details, imagery, references, links, and photos at IcySeas. It (they) did not move much for a day. Is it about to hit by sea ice? Will that get it more stuck or increase drag on it from the current out of Nares strait? I believe the segment labeled as PII-2012-A-e-1 is still grounded with the other sections traveling with the current. Split zooms using Sept.11 & Sept 14 appear to confirm this. The below is from Dr. Muenchow's site and shows the naming of the various remaining islands. today shows both large pieces still in this position as far as I can tell. Everything with the exception of PII-2012-A-1-f appears to be afloat again and heading south after the spring tide of the 20th. At some point they will all be caught up in the freeze and will spend the winter either grounded or frozen into the sea ice in deep waters. The polar bears witnessed by the Vagabond's crew are in for a long voyage. With clear sky today terra confirms Terry's description. PII-2012-A-1-f stuck in place since the 20th, PII-2012-A-1-e seems stranded a little further south. Sea ice drifting past both. Landsat 8 hires (15m) image of PII-2012 on Sep 6. Just left the Smith Sound and a few days before the break. The "central channel" along it will break is ready for separation. Click on the image for the full resolution! The "Central Channel" (previous melt river) is not necessary where it will break, it may do so, but it is only a "small" cut relative to the thickness of that "island". But it is a like scratch in a window? Espen, I guess you are right. The break might not be right at that visible channel, but near and parallel to it. I could not locate a landsat image after the break, I will look again. Found it, break was indeed at the darker band south of the central stream channel. Large varying shadows show thickness of the iceberg shards are quite different. Where is the Island actually located now? According the LandsatLook viewer at 76.69oN and -76.02oW. About 40km from DevonEllesmere Island. It is visible on the last available landsat image on the 10th of Oktober. Sorry that was Ellesmere. I located the other big shard 85km SW of the other piece. In the attached image the island is Coburg, in the middle of the exit from the Jones Sound. Click on the image for the full res image, icebergs can be distinguished from sea ice by the shadows that their height is casting. Are you sure about Ellesmere Island, I think it is Coburg Island? The first shard I showed is nearer Ellesmere, the second near Coburg Island. Here, a low res but full image with several icebergs marked on the 10th of October. LandsatLook viewer gives me ~85 km, counting pixels (of 16*15=240m) gives me about the same distance. I have added a scaled bar to the image to make the distances clearer. I very much like the LandSat-8 imagery, thank you for sharing, Wipneus. Detailed profiles of both the surface and bottom (and melt rates) of Petermann's ice shelf from laser and ice-sounding radar are shown in the attached plots. The vertical bars on the first one (Fig.-3) show the limits of the 2010 and 2012 ice islands while they were still attached. The paper will appear later this year in the Journal of Glaciology. Pre-prints available at my web-site or blog. Data are in the public domain via NSIDC which is where I found them. Amazing ASAR image of the Kane Basin today. If we can interpret the lighter shades as thicker ice, it's clear there is no continuity in any arch-like line. Two pieces of the fast ice broke off last week. It's fascinating to git a better look at the sites where they broke and speculate about how the remaining ice might hold up in the coming melt season. Hi Sonia, I see you got in the DMI Image Box too! Has it been magically resurrected? If we can interpret the lighter shades as thicker ice, it's clear there is no continuity in any arch-like line. Two pieces of the fast ice broke off last week. It's fascinating to get a better look at the sites where they broke and speculate about how the remaining ice might hold up in the coming melt season. http://ocean.dmi.dk/arctic/image_container.phpwhere the much thicker glacier ice shows up darker than sea ice in the fjord in front of it. Great to have these radar images nevertheless, does anybody know why they have reappeared? Interpreting radar imagery can be tricky, as dark tones can mean smooth ice (200cm), or very New ice (5cm), or Grease ice (2cm). Bright tones can be rough young ice (5-15cm), or rough First-year ice (>150cm), or Multi-year rubble (>3m), or icebergs. The big trick to interpreting radar imagery correctly is to look at the fracture type of the target. Thin/New ice has ragged fractures, Thin FY has more angular fractures, and Multi-year ice can have very long straight fractures. Decayed second-year ice has curvilinear fractures, etc. etc. The study and use of fracture type and shape is the only reliable way to interpret radar imagery; tone can be dark one day, then bright the next day, then in-between the next day, all depending on wind/weather. Using tone alone to interpret radar imagery is a rookie mistake. Landsat 8 image of the Kane Basin with ice arch. The low sun (elevation 7.6 degrees) makes it as yet difficult to say much more about the state of the stuck sea ice. I now see lots of amazing images suddenly available via DMI. However last I heard ENVISAT was dead. Has it been magically resurrected? Here is a thermal image of the entry to Nares as seen by Landsat 7 on January 18 2014. The stripes are caused by a malfunction in Landsat 7 sensors. Not good for nice images, but still useful for science. Since it is thermal, lighter means warmer. The blocking ice is dark, cold and thick. Thinner ice and especially cracks are brighter. Wipneus, thank you for digging up that image! It's fascinating. January 18th, hm? For any who might not have been following so closely, that blocking ice wedged in there about January 1st. You can query the DMI archives around that date to watch it. I remember I was on the edge of my seat watching because thick ice had been pouring out of the Lincoln Sea. Of course it may not even matter with the the way the ice in the Lincoln has been cracking lately. If this dipole keeps up we may not need the Nares to clear the Lincoln of ice! Also thank you Jim, for posting the radar image and discovering that the DMI radar images are now coming from RADARSAT. When the blockage opens we'll see a lot of old MYI heading south without having to round Cap Morris Jesup to make it's escape. I've been taken aback by how robust it's proven to be and don't expect it to last much longer. The constant flow of water below coupled with gale force winds that often blow through the strait will combine at some point to break it and it's not thick enough to bottom out once freed. 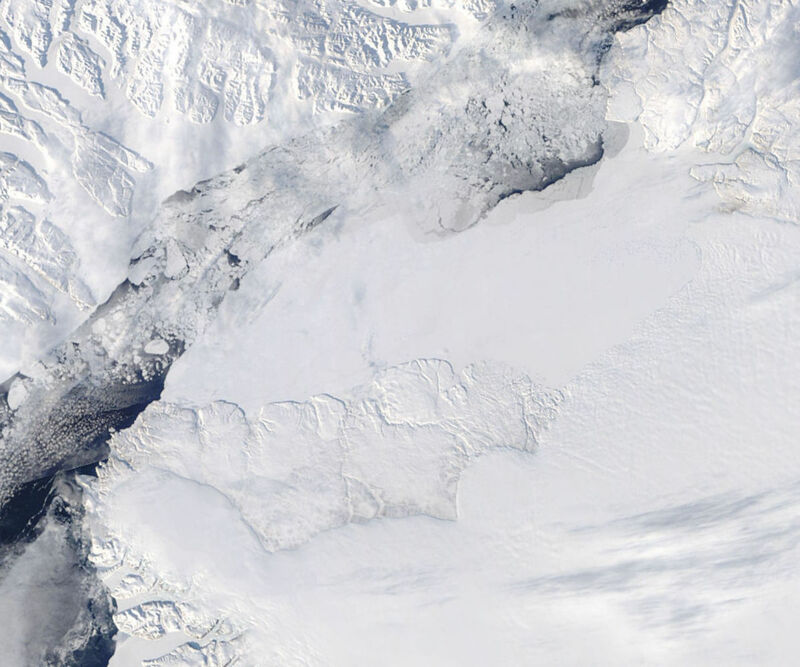 I don't expect much from Petermann Glacier this year, but I didn't expect anything in 2012 either. All the experts agree that Humboldt Glacier isn't going anywhere fast but each year I'm fascinated by the icebergs calving into Kane Basin & the silty waters near it's face. If the grounding line proves to be no more than a sand and gravel moraine it doesn't seem impossible for it to be washed out by large fluxes of melt water from below the ice. The Arctic continues to confound. 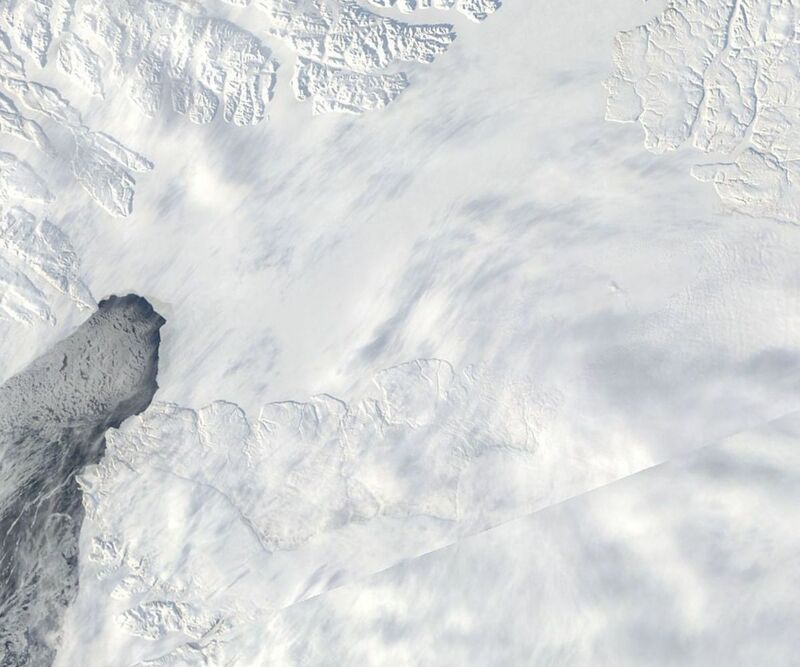 Small part of the blocking ice is visible in today's Landsat inbox. Contrast in this visible is somewhat low, I will fiddle with the contrasts a bit later. Here is an attempt to make the blocking ice easier to see. I assume that we're seeing is ice that is predominantly >2 years old and has been through the grind of compaction on more than one occasion. The relatively smooth surface it presents was not what I expected, though perhaps snow is hiding a more rough, ridged understructure. Despite there being no evidence of the more normal arch shape it seems to be holding up to the stress. When it first lodged in place in early January I didn't think it would last the week. The quality of the images you are posting is amazing and allows us a very intimate view of Arctic. I've been drawn to the changes in fast ice along the Arctic coasts as I think that as these are swept away it they take with them any hope the deniers have of claiming that this is all part of some natural cycle that will soon reassert itself to refreeze the Arctic. The driftwood located at the head of fjords that had been locked in place for ~5,000 years make mockery of their claims that things were warmer when the Vikings disembarked in Greenland, let alone the claims that it was warmer in the 1930's. When the melt season has progressed perhaps I'll be able to get the Lat & Long for a particular drift wood sample that has been carbon dated & we could make an image of the region showing open water lapping on the rocks. Even the most oblivious would have to admit that what they are viewing proves that this in no repeating phenomena responding to solar cycles, the AMO or any of the other excuses they typically offer. 2010 stands out as one heck of an outlier; otherwise, the Nares bridge is much closer to the Lincoln Sea end of the Kane basin than in the other recent years. IIRC, this area has not been especially warm this winter, so the bridge could prove sturdy; but it has formed in an interesting place. Yes, I would like to do that. However, this is image is as North as we can hope*) for. I am not sure at what latitude this driftwood was found, but we cannot get all the way to the top of Greenland. *) as explained before, images from the ascending part of the orbit go a bit further, but those images are extremely rare. 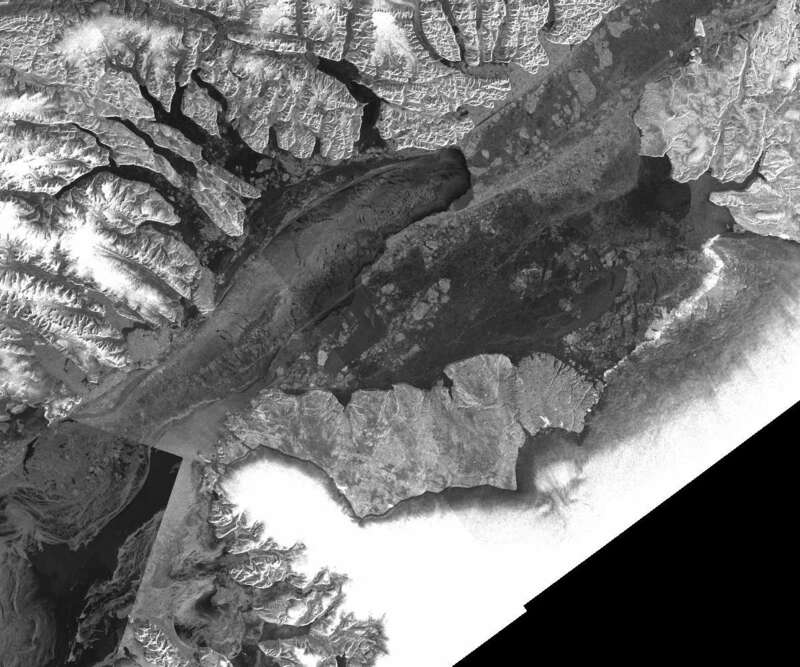 A number of extreme northern Greenland Landsat images were added last night. 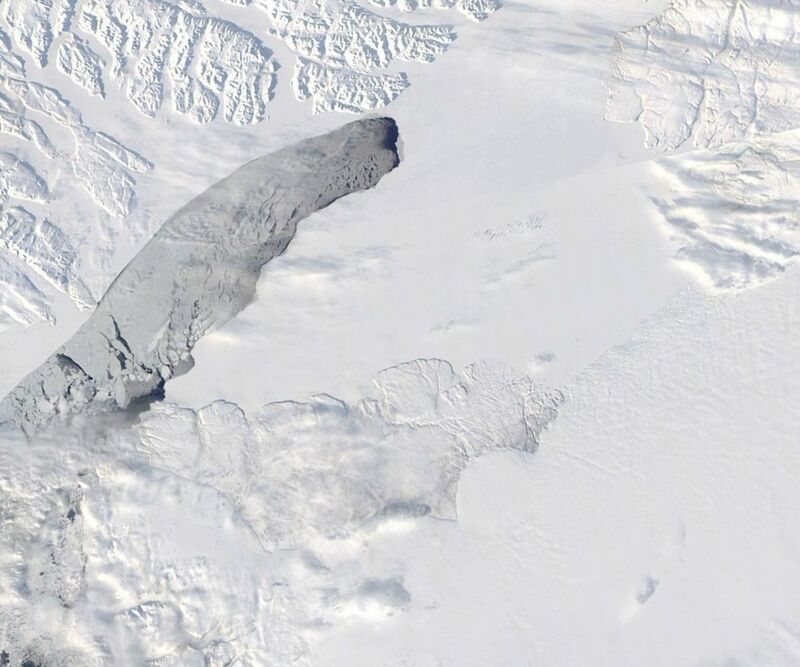 Also the first full image of the block of ice blocking the entrance of the Nares Strait. Alas, it is cloudy. But i think enough can be seen to justify to post it. Large chunks of fast ice are now unfastened downstream of the "Arch".